I absolutely love my Clarisonic Mia cleansing brush (review coming soon). It has literally changed the look and feel of my skin; I am obsessed. 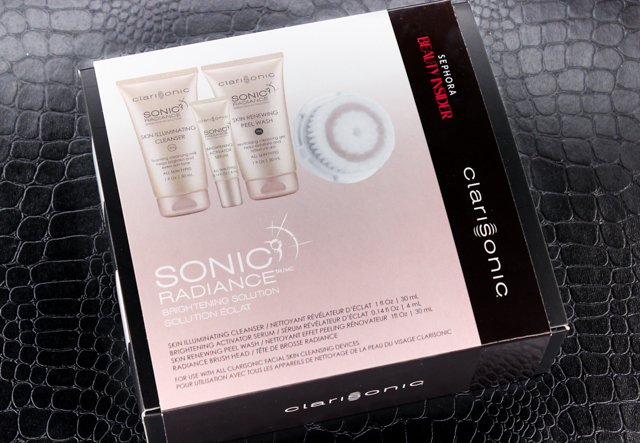 When I saw that Sephora was offering the Clarisonic Sonic Radiance Brightening Solution kit as a beauty insider 500 point reward, redeeming my points for it wasn't hard to do. Especially since it included three generously sized skincare products, plus a full-size brush head. All of these items are meant to be used in conjunction with each other, to brighten and even the skin. 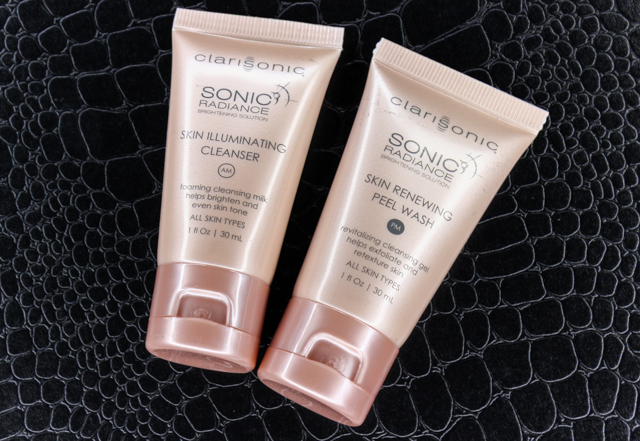 Skin Illuminating Cleanser (AM): This paraben and sulfate free foaming cleansing milk helps remove impurities, and contains extracts like licorice root and ginkgo biloba leaf to even and brighten the skin. It also contains peppermint leaf extract, to help calm and soothe. I cleanse with this in the morning and my skin is always soft after use. I also like that it doesn't strip moisture from my skin or dry it out. Skin Renewing Peel Wash (PM): This paraben free cleansing gel exfoliates and retexturizes the skin thanks to ingredients like LHA which supports natural skin cell turnover, and glycolic acid to boost moisture, improve texture, and fade dark spots. This is what I use at night and I absolutely love it. It's not harsh on my skin, and I love how it gives my complexion a smoother, more radiant look. Brightening Activator Serum: This serum helps with the fading of dark spots and discoloration, all while providing intense hydration. I apply this serum to my face and neck after cleansing, both morning and night. 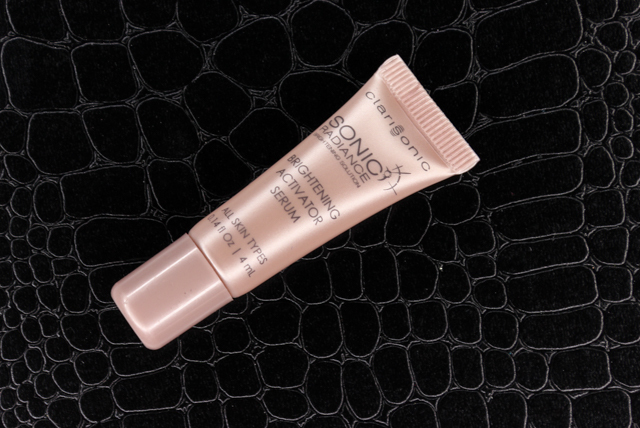 It feels really light on, it quickly absorbs into the skin, and it definitely ups the amp in the radiance department. It's also paraben free. Radiance Brush Head: This brush has been a lovely treat for my skin. It's gentle, and it really helps the cleansers thoroughly cleanse my skin. I haven't been using this kit for too long, but the results are very impressive so far. If things keep going down this positive route, I may purchase full size versions of the cleansers and serum, and deem this as my new skincare regimen. To be honest, the brush head is what initially sold me on this kit. But the surprise was on me because the other products are pretty darn good. My dull, uneven complexion is thanking me big time. And it shows. What do you all think of the Clarisonic? What products do you love for adding some radiance and evenness to the skin? Disclaimer: I redeemed my Sephora Beauty Insider points for this kit.